Dimensions (HxWxD): 32"x 20"x 21"
With the Swingline stack and shred 500M auto feed shredder you can shred as many as 500 sheets of paper automatically. 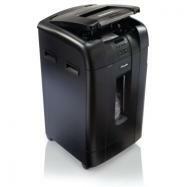 Save your time and work on other tasks while this Swingline stack and shred auto feed shredder shreds for you. All you need to do is insert a stack of 500 letter or legal size sheets with paper clips or staples into the auto feed tray, close the lid and walk away for the shredder to do its work. Moreover, the 500M auto feed shredder also features a locking mechanism where a user enters a 4-digit PIN code to interrupt shredding. Only an authorized person can enter the PIN code. Once the shredding process is finished only then any other person can use the shredder. In order to shred CD’s/DVD’s, credit cards, glossy and folded sheets, the swingline 500M shredder has separate manual slot where you can shred up to 10 sheets at once. The shredder is specially designed for destroying highly confidential information like sensitive financial and personal identification data and delivers level 4 (P-5) high security. The Swingline stack and shred 500M auto feed shredder will shred your documents into approximately 2000 pieces of size 1/8”x1/2”. The shreds fall into a 21-gallon waste bin, which is easily pulled out when you have to empty it. Moreover, the 500M auto feed shredder is built with a transparent view window that indicates the user when the waste bin is full and needs to be emptied. Shred up to 500 legal and letter size sheets automatically and 10 sheets manually in one cycle.